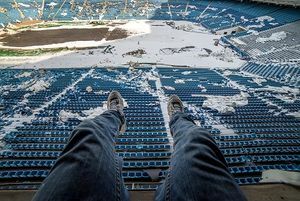 Pontiac Silverdome (Detroit), host to a Super Bowl, in miserable disrepair prior to its demolition. Unplug the NFL is advocated by Conservapedia in response to the NFL's paganism, its lack of true athletic competitiveness, its promotion of gambling rather than sportsmanship, its predictable outcomes in playoffs due to obsessive coaching, and its exclusion of Tim Tebow apparently for quoting the Bible too much. Collusion among owners and coaches makes the NFL more like rigged professional wrestling than genuine athletic competitions like the Olympics. Players are cut or added to NFL squads based less-and-less on merit, and most playoff games are won or lost based on decisions by non-athletic coaches. Additional reasons for unplugging the NFL include how it bilks taxpayers for an estimated $1 billion annually and even got the FBI to waste money by searching for a player's jersey in Mexico in 2017. The NFL panders to the liberal media and encourages "fantasy football," a form of gambling and false worship. Genuine fans—as opposed to gamblers—are mostly irrelevant to the NFL profit model. Beginning in 2016, the NFL has allowed displays of defiance against the National Anthem. Search on "demonic" and "NFL" on the internet and see a half million websites discussing it. The Washington Redskins cut one of the finest safeties in the NFL because he publicly criticized its awful coaching, and he pointed out that he probably watches more game films than the coaches do. Fans were furious how coaches cut this star, but genuine fans are irrelevant to NFL profits. This and other moves by the NFL shows that is more like professional wrestling, where participants are expected to puff up the product, than a meritocracy. There is an average of only 11 minutes of football action in a typical 3-hour NFL broadcast. Commercials, usually for beer or fantasy football, consume a third of the broadcast. Cheerleaders are rarely, if ever, shown in most NFL broadcasts anymore, while injured players are shown more than celebrating players. Much of what the NFL does is fraudulent. While star NFL player Aaron Hernandez committed murder and later reportedly hung himself in prison when serving a life sentence for it, his team the New England Patriots gave outspokenly Christian Tim Tebow a phony tryout, apparently to deflect from the scandal. The public is further misled in how NFL players are promoted as superstar athletes, but many are actually in poor aerobic shape from a medical perspective and have reduced life expectancies. Often the better athlete—such as a quarterback with a stronger arm—is benched in favor of a weaker athlete who can "read" defenses and throw sissy short passes, as Tom Brady does. NFL-promoted "fantasy football" has grown from only 12 million participants a decade ago to an estimated 56 million, mostly men, today. In addition, the NFL advances the homosexual agenda, such as with its halftime shows at the Super Bowl. Gambling on the Super Bowl topped $4.7 billion (not million) in 2018. Timothy McVeigh lost his life savings by gambling on his hometown Buffalo team in the 1993 Super Bowl, and in his despair turned his obsession to the Branch Davidian standoff, according to Politico.com. If the NFL does not want Christians who quote the Bible, then Christians should not want the NFL. There are many alternatives for sports fans, including high school and college football, golf, NASCAR, wrestling, baseball, basketball and, outside the U.S., soccer, tennis, rugby, ice hockey and cricket. There is also the option of spending less time watching televised sports, and spending that time more productively instead such as reading or studying mathematics, science, literature, religion, foreign languages, and/or history. Much of the appeal of the NFL is the illusion that it is merit-based, like the Olympics, and has the best players. But the exclusion of Tim Tebow proves that the NFL is not really based on merit, but on political correctness. There is also a growing concern that watching or supporting the NFL may be immoral, in light of a study revealing that 96% of deceased NFL players test positive for chronic traumatic encephalopathy, or CTE. Other studies suggest that the "average life expectancy of a retired NFL player is 55 years," and that "retired NFL players suffer from Alzheimer's at a 37 per cent higher rate than average." Some have compared watching NFL games to what the Romans did in watching the brutal gladiator fights, which is widely recognized to have been immoral and harmful to the society. 11 NFL Hall of Fame bias? "Sports Illustrated estimated in 2009 that 78 percent of NFL players are bankrupt or facing serious financial stress within two years of ending their playing careers and that 60 percent of NBA players are broke within five years of retiring from the game." Chris Borland, one of the top rookies in the NFL in 2014, abruptly retired before the 2015 season due to safety concerns. "I just honestly want to do what's best for my health," Borland said. "From what I've researched and what I've experienced, I don't think it's worth the risk." The late NFL star quarterback Ken Stabler "had Stage 3 chronic traumatic encephalopathy ... widespread throughout his brain, with 'quite severe' damage to the regions involving learning, memory and regulation of emotion." A professor of neurology at Boston University, Dr. Ann McKee, observed that "we've now found CTE in former NFL players who played every position except kicker." Of the 34 NFL player brains that McKee examined, 33 had CTE. The NFL players' union has pressed for health insurance and greater safety measures to address the well-documented health problems experienced by NFL players and alumni. Quincy Monk, a former linebacker for the New York Giants, had a stroke at the age of only 35 and then died a year later from cancer. Numerous people who played in the NFL have committed suicide (in some instances, Junior Seau most notably, upon examination of their brains CTE was noted). Mike Webster, a four-time Super Bowl winner as center for the Pittsburgh Steelers, died of a heart attack at the age of only 50, and the autopsy of his brain revealed that it was one of "boxers, very old people with Alzheimer's disease or someone who had suffered a severe head wound," quoting pathologist Bennet Omalu of the Allegheny Medical coroner's office. Lem Barney, one of the greatest defensive backs ever in the NFL, predicted in 2013 that the sport would not exist within the next two decades, because of how harmful it has become. Despite being one of the best players ever, he wishes he had driven a truck or a cab instead. Performance-enhancing substance abuse has widespread for a long time in the NFL, as owners and the players' union engage in liberal denial about it while profiting from the more violent play. Lyle Alzado, a much-promoted star in the 1970s and 1980s, died at the age of only 43 from a rare form of cancer that he attributed to his steroid use, Alzado said he began taking anabolic steroids in 1969 (at the age of 20) and took them throughout his football career. At least one expert has opined that problem is never going away. The NFL banned substances policy has drawn criticism, but the policy is one of the longest running in professional sports, beginning in 1987. Since the NFL started random, year-round tests and suspending players for banned substances, many more players have been found to be in violation of the policy. By April 2005, 111 NFL players had tested positive for banned substances, and of those 111, the NFL suspended 54. The NFL testing for substance abuse is notoriously inadequate, as illustrated by the case of the convicted first-degree murderer, then-NFL star Aaron Hernandez. Unlike Olympic sports and the Ultimate Fighting Championship, the NFL administers its substance abuse program independently of the United States Anti-Doping Agency (USADA). So, the quality and rigor of the NFL's drug testing is not independently controlled. However, since December 2009, USADA has a "Supplement Safety Now" program, in partnership with the NFL, Major League Baseball, the National Basketball Association (NBA), the National Hockey League, the U.S. Olympic Committee and other national sports and health organizations. The program seeks to end dangerous and unscrupulous practices of "rogue" manufacturers within the nutritional supplement industry. The effort works to eliminate the practice of selling supplement products containing steroids and other drugs which are labeled as "safe and legal" dietary supplements. There are "Five Reasons Losing an NFL Football Team is Good for a City," and the first reason is that the NFL bilks taxpayers of billions of dollars. Even though NFL owners are making billions of dollars for themselves, they get taxpayers to foot much of the costs for their stadiums. On December 17, 2015, the NFL demanded that the State of Missouri reduce the obligation by the NFL for a new $1.1 billion stadium in St. Louis to less than 20% of the cost, with taxpayers of the struggling city then bearing the bulk of the enormous cost. An economist concluded that the NFL's estimate of economic benefit to a city hosting a Super Bowl is "is inflated by a factor of about five." The mayor of Glendale, Arizona (home of University of Phoenix Stadium, home of the Arizona Cardinals and host of the 2015 Super Bowl), did not even attend the game and "was worried that his cash-strapped city of 230,000 won't be able to afford the added costs that come with the Super Bowl, including $2.1 million in additional security. To make matters worse, approximately 40 percent of Glendale's debt is earmarked to paying off sports complexes." In 2014, multiple articles explained that the NFL was grossly exaggerating any local economic benefit of hosting the Super Bowl, and one economist estimates that the economic benefit is zero. See, e.g., "Super Bowl 2014: Economist says NFL is full of it about local benefits of hosting game." Meanwhile, government workers at taxpayer expense spent two years preparing for the event. After the Super Bowl in New Jersey in 2014, local businesses complained about the lack of boost in customers. At best, only a handful of warm-weather cities which are tourist destinations in and of themselves possibly benefit from hosting a Super Bowl. An example of a city that has done so successfully is New Orleans, which has a large indoor stadium (the Mercedes-Benz Superdome) that has hosted numerous large-scale events, including six of the seven prior Super Bowls held in the city. Yet the NFL decided not to award Super Bowl LII in 2018 to New Orleans—which was celebrating its tri-centennial that year, and was clearly able to host both it and the Super Bowl—and instead awarded it to cold-weather Minneapolis-St. Paul as they were able to connive taxpayers into building a new stadium for the Minnesota Vikings franchise. The 2018 Super Bowl showed an attendance anomaly -- attendance was reported at 70,081, nearly 3,000 fewer fans than attended the MLS Cup (Major League Soccer final) in the same stadium two months prior, notwithstanding the general lack of interest in soccer among American fans, especially in the American South where football is widely popular. Liberals attempted to force relocation of the Super Bowl from Houston, the 2017 edition's host city, to pressure that city to cave in to the homosexual agenda as revenge for losing to conservatives 61% to 39% in Houston's recent referendum involving Houston's leftist, feminist and openly lesbian then-mayor Annise Parker's attempt to force the city to cater to the gender-confused by allowing them to use restrooms of the opposite gender (i.e., "transgender" men insisting on using women's restrooms). In 2017, Lady Gaga sang for the Super Bowl halftime show. Lady Gaga is also known for her political activism, particularly with Hilliary Clinton, immigration, HIV/AIDS, and homosexual "rights". In 2015, the Super Bowl halftime show featured in nearly every performance the pro-homosexual activist Katy Perry. She became popular among liberals for her pro-lesbian song in 2008, and is an outspoken supporter of homosexual "rights". On February 1, 2004, the Super Bowl halftime show featured Justin Timberlake and Janet Jackson and was broadcast live on CBS. Timberlake tore away the portion of Jackson's costume exposing her breast. They later tried to explain it away as a "wardrobe malfunction". The Federal Communications Commission (FCC) fined CBS a record $550,000 which was fought in the Supreme Court, The fine was ultimately overturned in 2011. The Super Bowl halftime show features bizarre symbolism that has been associated with the occult and/or gambling. Beginning in 2012, the NFL began allowing casino advertisements at stadiums during games. The NFL allows ESPN to publicize point-spreads that encourage gambling, while the NFL publicly pretends to oppose betting on its games. The Super Bowl is the basis of more gambling than any other event, and the NFL profits from that through increased viewership. The gambling drives television viewership up, while actual attendance by fans at football stadiums has generally not grown. With the NFL's exclusion of Tebow—who is very popular with fans at stadiums—the NFL may be saying that genuine fans (as opposed to gamblers and television viewers) don't really matter to the NFL's business model. The Catechism of the Catholic Church does not address whether gambling violates the First Commandment against idolatry (gamblers worship uncertainty and fall prey to superstition). The Catholic Church has stated that gambling becomes morally unacceptable when they deprive someone of what is necessary to provide for his needs and those of others. The passion for gambling then risks becoming an enslavement. The early church excommunicated people for gambling, and theologians today generally consider gambling to be morally licit under certain conditions. Among Protestants, fundamentalists are the most stringent opponents of gambling, believing it to be wrong in all cases. Evangelicals and Pentecostals/charismatics have generally opposed it as well, though not as stringently as fundamentalists. Mainline Protestants -- consistent with their generally liberal theology -- generally have only provided token opposition. Numerous experts have proven that Tim Tebow is fully qualified to play in the NFL. The widely followed Bleacher Report declared, after reviewing Tebow's record and strong preseason in 2015, that he "belongs in the NFL." CBS in Philadelphia reported on September 4, 2015, that there was an open spot on the roster for Tebow, after a weaker player was traded to another team. Bleacher Report wrote that "it seemed as though Tebow would make the team. He certainly made a strong case for himself in the Eagles' preseason finale ...." Yet Tebow was inexplicably cut by the Eagles, despite how the Eagles left themselves with only two quarterbacks on the roster, one of which is injury-prone. The Eagles then replaced the more-qualified Tebow on the roster with an undrafted QB named Stephen Morris, who had never played a single regular season NFL game, and who threw 30 interceptions in college. One sports analyst wrote about the Eagles' coach in making this decision: "what he sees in Morris -- that nobody else does -- is perplexing. An executive in personnel for another NFC team was texted, 'Tell me what you know about Stephen Morris.' His response was two words: 'He's bad.'" Further proof that Tebow should be in the NFL is the fact that the Eagles traded a quarterback who did not play as well as Tebow in exchange for a seventh-round draft pick. Thus Tebow is more valuable than that. But the Eagles cut Tebow outright without receiving anything. Apparently no other team in the NFL will play Tebow, and the only plausible explanation is that the NFL is appeasing the pro-homosexual media by refusing to allow the Bible-quoting Tebow to play. Despite not having Tebow on the team in 2018, the Eagles won their first Super Bowl with Nick Foles, another Christian and a Liberty University online student majoring in theology, as quarterback. Tebow was immensely popular with fans, who chanted "Tebow! Tebow!" when he entered the first pre-season game in 2015 in the 3rd quarter. He proceeded to score a touchdown as the Eagles beat the Colts 36-10, and played well in his other games. Every Tim Tebow jersey enters in the NFLshop's list of best-selling jerseys. Tebow's time with the Eagles put his number 11 jersey in 16th place, ahead of first string quarterback Tony Romo. The NFL looked like a true patriotic organization when they decided to honor the troops during halftime performances. Later it was revealed that 14 teams were paid by taxpayer-funded tributes, that is, $5.4 million from the Department of Defense went to NFL teams so they could hold military ceremonies. This despite the fact the NFL earned revenues of $9.5 billion. Appreciation for our military only if they pay, nothing patriotic about it. After the murder of five police officers in Dallas, the Cowboys requested to honor their sacrifice with a ribbon on their uniforms. Request denied by NFL commissioner Roger Goodell, who thought this move would upset the liberal terrorists of the Black lives matter movement. Liberal causes such as the Planned Parenthood-aligned Komen breast cancer awareness campaign get special treatment; pink ribbons on the field, pink official penalty flags, pink socks worn by players. The season generally begins the second week of September. Some players choose to wear cleats themed with patriotic images of 9/11. League management insists that if you choose this honor you will face stiff fines for violating uniform code. The police union offered to pay the players fines. At the very last minute, due to negative publicity, the NFL relented its decision. However, when DeSean Jackson had anti-police, black supremacy themed cleats, the NFL allowed it free of charge. Many liberals hold open contempt for their country. Colin Kaepernick blames the USA for abuse of black people by police (while ignoring that most police and law enforcement forces also employ black officers) and decides to sit during the National Anthem, to wear socks at practice mocking police as "pigs", and to wear a Che Guevara shirt, creating a national firestorm. Instead of publicly admonishing his actions, the liberal NFL management decided it was acceptable free speech. That image of disrespect now becomes a negative influence on other players. Boycott the NFL would be a top trending hashtag on Twitter. Sponsors abandoned players that supported this act of disloyalty to the nation. Videos of people burning Kaepernick's jersey went viral. The police union considered boycotting their presence at stadiums. Instead of wielding their undue influence, like they do on a regular basis, and protect the image of the NFL by fining or suspending those players making the sport look bad, NFL management would issue a weak press release stating they don't agree with Kaepernick's position. Like a good liberal, Goodell praises the protest against the National Anthem and encourages activism for social change. NFL ratings are at seven-year lows after two weeks into the 2016 season. While overseas, NFL players stood and honored "God Save the Queen", even though it is Britain's fault that slaves were brought to America in the first place. NFL players and their supporters like to proclaim that the entire episode is specifically about race. In a demonstration of liberal hypocrisy, the NFL has exploited cheerleaders with below-minimum-wage compensation, despite how fat cat owners are making billions at taxpayer expense. For example, the New York Jets are valued at $2.6 billion but the "Jets cheerleaders were given only $150 per game, and weren’t paid for any practice time," and had to sue just to obtain minimum wage for practice and travel. In addition, onerous conditions are imposed on NFL cheerleaders as to hairstyle. If a conservative-owned business engaged in such unequal pay, liberals would be enraged and would call the owners "misogynistic." NFL Hall of Fame bias? The NFL writers—who decide who does and does not get into the NFL Hall of Fame—have not been consistent (and some might even say, biased) -- in their voting patterns. Some claim that players who were open about their Christian faith were excluded (and still are). One example of potential bias involves wide receiver Tim Brown. At the time of his retirement he ranked number five all-time in total yardage gained, despite playing for weak teams. But Brown also openly preached the Gospel, and even played Gospel music in the weight room. He was kept out of the NFL Hall of Fame for his first five years of eligibility, and was not inducted until 2015. Another example involves outspoken Christian, Herschel Walker, who said, "We have the DNA of our Lord Jesus Christ." The NFL refused to allow him to play in the NFL when he had one year of eligibility left in college, despite that he was clearly able to play. Walker became the leading star of a rival league (the USFL) until it folded, and was the centerpiece of a trade that allowed the NFL's marquee franchise—the Dallas Cowboys—to rebuild and win three Super Bowls in the early 1990s. Yet despite his accomplishments, and his single-handedly causing the NFL to change its draft eligibility rules, Walker was never inducted during his eligibility period. ESPN reported that the "Spygate" scandal was bigger than the NFL admitted, and that "tapes and notes were found, and then destroyed on commissioner Roger Goodell's orders: league executives 'stomped the tapes into pieces and shredded the papers inside a Gillette Stadium conference room.'" NFL players belong to a union that sides with liberals in opposing right to work laws, and the NFL players union even spoke out against a proposal in 2015 to make Wisconsin the 25th right-to-work state. While the NFL excludes Tebow for frequently quoting the Bible, the NBA did not punish Steph Curry for beginning his MVP acceptance speech by expressly thanking Jesus Christ, "first and foremost." NFL Commissioner Roger Goodell has repeatedly abused his authority, and invented unjust punishments by making up his own rules after the facts. He has been publicly reversed in several high-profile cases, including Tom Brady, Adrian Peterson, Ray Rice and the New Orleans Saints’ bounty scandal. He has earned over $100M in five years, including $44M in 2012. His salary was disclosed because the NFL was claiming non-profit status on its tax return. A disgruntled NFL owner complained to The Daily Caller, "I don’t like him. I think it’s time for a new commissioner." The criticism of Goodell comes after he was loudly booed at the NFL draft by the crowd. The liberal media of ESPN is protecting Goodell from all criticism, likely because they don't want to risk any potential lost revenue from the NFL. A website known as Scout (founded in 2001) has links to many NFL fan sites. These NFL fan sites have "clever" names based on the team's name, colors, or whatnot. Many of them are chat board sites where people talk to other NFL fans, most of whom they don't know in person. They can be just as dangerous as other social media as far as cyberbullying goes, if not more. Similarly to fantasy football, these websites alienate their average participants from their friends, family, occupations, education, and the Bible. ↑ The slogan "unplug the NFL" was created by Conservapedia, with this entry. Others are welcome to use this slogan with attribution. ↑ "From very early times gambling was forbidden by canon law. Two of the oldest among the so-called canons of the Apostles forbade games of chance under pain of excommunication to clergy and laity alike." See Catholic Encyclopedia, which continues to observe: "The 79th canon of the Council of Elvira (306) decreed that one of the faithful who had been guilty of gambling might be, on amendment, restored to communion after the lapse of a year. A homily (the famous "De Aleatoribus") long ascribed by St. Cyprian, but by modern scholars variously attributed to Popes Victor I, Callistus I, and Melchiades, and which undoubtedly is a very early and interesting monument of Christian antiquity, is a vigorous denunciation of gambling. The Fourth Lateran Council (1215), by a decree subsequently inserted in the "Corpus Juris", forbade clerics to play or to be present at games of chance. Some authorities, such as Aubespine, have attempted to explain the severity of the ancient canons against gambling by supposing that idolatry was often connected with it in practice. The pieces that were played with were small-sized idols, or images of the gods, which were invoked by the players for good luck." ↑ When will fans realize that NFL owners don't care about them? ↑ 23.0 23.1 NFL Steroid Policy 'Not Perfect'. CBS News (2005-04-27). ↑ "NFL's Steroid Policy Gets Kudos on Capitol Hill", 2005-04-28. Retrieved on 2017-01-05. ↑ It should be noted, though, that only a handful of NFL cities also have a university with a football team which is a member of a FBS "Power 5" conference, and only one -- Los Angeles -- has two such universities. Even so, many of those programs have never benefitted from increased attendance at collegiate games when the team has done well while the professional team has done poorly. ↑ Though many new stadiums have been built in areas which were already blighted. ↑ A portion of that debt does not pertain to the NFL, but to the city's inexplicable decision to build a separate arena for the area's NHL Arizona Coyotes franchise instead of the team sharing an arena with the NBA's Phoenix Suns franchise; in every other case where a metropolitan area has both an NBA and an NHL franchise, the teams -- even if owned by different owners -- share the same arena. The problem was made worse by the team's poor performance and repeated threats to relocate -- even though the team itself relocated to the Phoenix area from Winnipeg, Canada. ↑ Played in an outdoor stadium in February, generally a bitterly cold time of the year. ↑ It should be noted that the MLS Cup featured a local franchise, Atlanta United FC, in the final. ↑ Nekesa Mumbi Moody. "Janet Jackson Apologizes for Bared Breast", February 3, 2004. Archived from the original on February 3, 2004. Also published by CNN.com as "Apologetic Jackson says 'costume reveal' went awry". ↑ Jennifer C. Kerr. "CBS Fined $550,000 for Jackson Stunt", July 1, 2004. Archived from the original on September 28, 2004. Also published by CBSNews.com as "CBS Dealt Record Fine Over Janet". ↑ The NFL now allows players to declare for the NFL draft after being out of high school for three years. ↑ Announced in 2018 that it ended its sponsorship, and immediately saw a 4% stock price jump. This page has been accessed 97,355 times.